Navitas Not Welcome In Bournville! 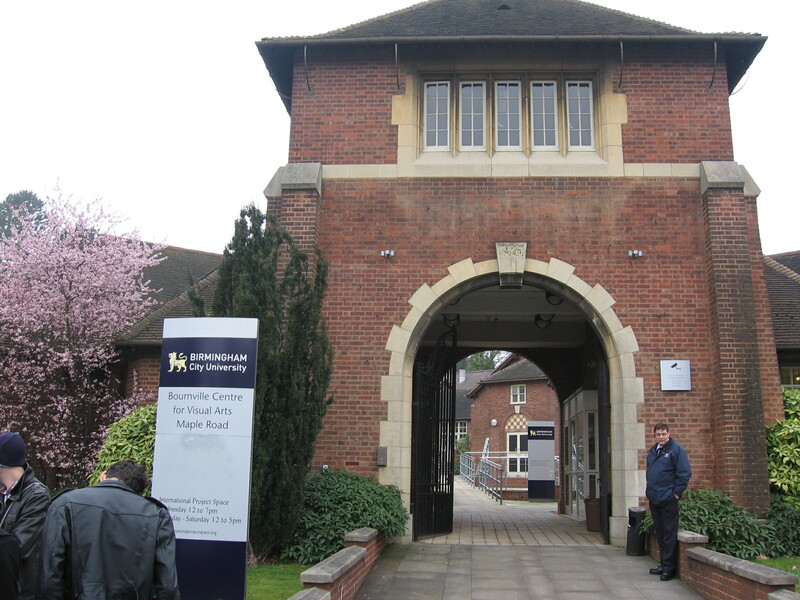 At lunchtime today there was a stall and petitioning session outside the Bournville School of Art, which is leased by the Birmingham City University from the Bournville Village Trust. This was to protest against the privatisation of the education service there, and the extra course costs that are being imposed on top of tuition fees for students. The stall was supported by Stirchley and Cotteridge against the Cuts. The plan, that is being carried out without consultation, is to transfer the BA (Hons) Art and Design course to a new location in Margaret Street and the Edexcel foundation course to a new building in Eastside in 2013, and the two buildings on the Bournville Green would be used as a training base for foreign students, as a precursor to taking degree courses at Birmingham University. This lease is being handed over to Navitas, an Australian-based, for-profit education company, and they expect to move into two of the rooms by May and begin operations. The university will hope to benefit from all of this by having a greater uptake from foreign students, which would increase its revenue. There is no objection to foreign students coming here, that is not the issue. It is an issue of privatisation and cost-cutting. The university could do the pre-course training in-house. And if they really wanted a special location, there is a very suitable building that has become available recently. The Gemeindehaus student residence nearby is desperate to find a buyer, and if it could go to someone wanting to invest in student accommodation it could be the ideal solution. Also, Bournville Village Trust must be fully aware of the situation and it is surprising that they have not forwarded this information in order for the Change of Use to be effected on Ruskin Hall. Has the Bournville Village Trust agreed to it all in principle already? Already, there has been a running down of provision at the Bournville School of Art. The canteen has been closed for two years and now extra fees are being demanded of students, for example for materials and for the final year show. If Navitas get their hands on it, we can expect more cost-cutting, attacks on wages and conditions and a two-tier workforce, as they start employing their own staff. Whether the move to Margaret Street is a good idea as far as art teaching is concerned is another matter. However, the Bournville buildings are part of the Cadbury legacy, and when you consider that the adjacent Bournville J.I. School is considering academy status, we see a pattern of privatisation in the area and a full frontal attack on the ethos of Cadburyism. The three local Tory councillors have intervened into this issue, highlighting the loss of an important local resource, and combining their statements with racist dog-whistles about the influx of foreign students. They have drawn up their own petition and presented it. Could these three Councillors be the same ones who voted for £212 million cuts to the Birmingham City Council budget last year and £100 million cuts for next, and are part of the ruling coalition which is trying to privatise all of its leisure services, close children’s homes and decimate the Connexions service for young people? All the students that passed the stall agreed to sign, as did all the local passers-by. The campaign is beginning. My Art Foundation Course at Bournville in the late ’70’s was one of the most inspiring periods of my life which still resonates with me today, thanks greatly to the wonderful location of the college in the centre of Bournville village. I’m shocked that Birmingham is planning on moving it out. Damn them!!! I have wonderful memories of studying at Bournville school of Art in the early eighties. It was, not only the course taken, but the atmosphere and surroundings which was and surely still is the inspiration to many students in the art & design field. II went on to have a exciting & varied career in design & print all over the world. I am deeply saddened by the news that this beautiful place in Birmingham & “Cadbury World” history is going to be taken over by “out siders”. Yes by all means let oversea students come, but let them be able to study in this beautiful place, one of the very few wonders of Birmingham left that has not been taken over by privatisation & greed. I wonder what would have happened if the Quakers still owned Bournville? Idiots! It always felt good to me that people were still studying there and I remember the lovely place and the Foundation Art and Design course I did (1992). A part of that enjoyment was the ambiance and the history you felt linked to which gave you hope for the future. It felt ‘the right place’ for the school. It was cosy and human, a bit rough around the edges but that made you feel at home and the buildings had stood up for the battering given by generations of students because they were quality, built to last architecture. It felt like an oasis within the commerce of Birmingham. Is there an online petition anywhere? I haven’t seen one. I can not believe that such an iconic building is to be lost to the art world. I purposely chose to study at Bournville (in the early to mid eighties) for it’s unique ambiance, setting and reputation. The only draw back for a then 17 year old student was the long, long walk to the pub on a Friday afternoon (oblivious as I was at the time to the Quaker ethos). As Shelia asks, is there an online petition? Tragic, that such an iconic building can be wasted. I studied here in the 80’s & was inspired by the ambience of such an historic place. Is there a petition online? I remember those days walking to the pub! Going back on a Friday for the last Lecture. Happy Days. But we still have to or /make a New Petition! Why Should This Wonderful Place be Lost to Outsiders. Mary I cant find one? We May have to speak to the Royal Harky of Birmingham City Council? What Else Can We Do???? art history that was fed into student training.